BMT Asia Pacific (BMT), a subsidiary of BMT Group Ltd, says it has completed a major strategic study - “Enhancing Hong Kong’s Position as an International Maritime Centre (IMC)”, undertaken on behalf of the Hong Kong Transport and Housing Bureau. The study aims to plot a development roadmap and strategy that will enable Hong Kong to remain a successful IMC in an increasingly competitive region. 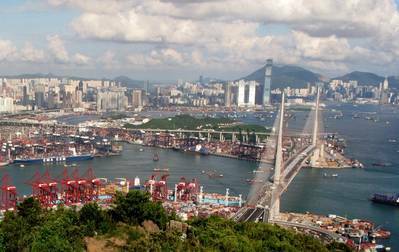 BMT explains that it conducted the IMC study utilising extensive industry engagement to examine the context and economic significance of Hong Kong’s maritime cluster, as well as the key challenges facing Hong Kong as an IMC. The findings, which were recently made available to the public, include strategies to maximise the development potential of key maritime activities and service areas, in particular the “contestable” services, which have been targeted by competing IMCs. Dr. Richard Colwill, Managing Director of BMT Asia Pacific comments: “Hong Kong has a rich maritime heritage and is home to a vibrant community of ship owners, ship managers and service providers engaged in a diverse range of activities spanning the industry. The maritime sector plays a vital role in the local economy and recognising its strategic value, governments across the region have taken an interest in developing similar clusters, requiring Hong Kong to maximise its competitive advantage." Dr. Simon Su, Director and Chief Economist at BMT Asia Pacific and the study’s manager continues: “Hong Kong’s role as an IMC is expressly supported in China’s 12th National Five Year Plan and by Hong Kong’s Chief Executive, CY Leung, who recently reinforced his pledge to further strengthen the city’s position by ‘developing quality and international maritime services’. We are extremely pleased to have had the opportunity to apply our expertise and experience in the Asia Pacific market to develop timely recommendations for shaping a bright future for Hong Kong’s maritime sector." BMT Asia Pacific is a specialist economic, environmental, design, planning and risk management consultancy serving primarily the energy, infrastructure and transport sectors. Through a diverse team of experts across Asia Pacific, it supports customers throughout the project lifecycle in the development of safe, efficient and sustainable systems, processes and infrastructure.